I was recently painting seagulls on beach as I sat in a beach chair. The problem with birds is they don’t stay still for very long. This seagull landed on the sand rather close to my chair, looking for food. I quickly sketched the bird in pencil lightly. By the time I finished my sketch the seagull was gone. I kept the visual picture in my mind as I started mixing a grey from ultramarine blue and burnt sienna watercolor paint. I painted the shadows on the seagulls body and then did a light wash using yellow and raw sienna for the background. I finished up the details on the bird’s wing and head, along with his legs. I added the birds shadow along with some seaweed. As you can see the paper I was using had heavy texture. I find it easier to paint less fine details with this kind of paper. To the right is another sketch I did while at the beach. This one is done with a black watercolor pencil that I dipped in water when I wanted a grey value. I spent more time completing this scene. 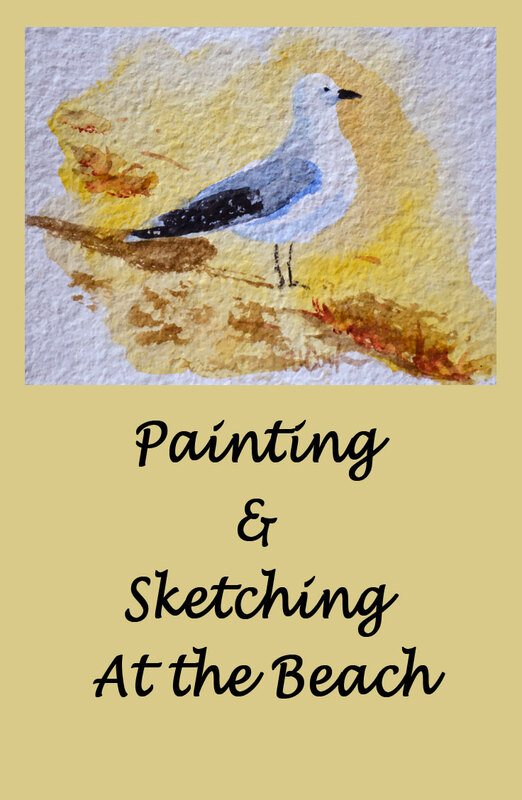 So the next time you have your watercolors try painting seagulls on the beach, or paint any view from your beach chair.